I have a confession. Each year when I look at the WOMADelaide program and study the list of artists I draw a blank. Well, not quite a blank. There are always a few celebrities – the likes of Baaba Maal and Lo’jo who make welcome return visits. But each year I head to WOMADelaide confident that these will be the best four days of the year for music, culture and dance, as the artists whose names mean little to me, then burst onto the stage; so colourful, so rich a mix of traditional and modern culture. On my list of 2012 “best evers” are the immaculate singer, songwriter, musician and dancer from Côte d’Ivoire, Dobet Gnahoré. Together with her stunning band – led by Colin Laroche de Féline, her French partner and co-composer – she effortlessly powered her way through a magnificent set, her vocal ease unaffected by the exuberant and athletic dance sequence interwoven into the performance. It’s this merging of traditional music with western influence that makes WOMAD such an ongoing success. Each day 20,000 people gain an extra level of respect for the strength and beauty of traditions from other communities. There’s no doubt it’s a powerhouse of global understanding, despite the inevitable quibbles about Westernisation. I was also looking forward to Bombay Royale, particularly because recycled Bollywood aprons, tablecloths and shopping bags have been such a big part of our fair trade partnership over the past year or two. Bombay Royale certainly didn’t disappoint. 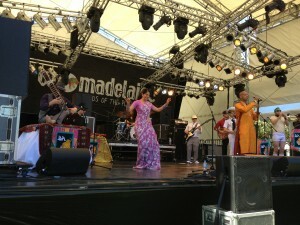 Their polished and exciting set brought Bollywood to Adelaide in style. The future is in very good hands too. WOMADelaide organizers bravely selected youthful sensations The Bearded Gypsy Band. They repaid that trust handsomely with an astonishingly vituoso set for an ecstatic crowd. Their prodigious skills produced a finessed performance that musicians with fifty years experience could well envy. Best of all they’re enthusing a new switched-on audience with their next-generation take on Reinhardt and the joys of gypsy jazz. Music must surely occupy a special place in human memory. I recall fondly the rich and haunting melodies of pan pipers on two sides of the planet – the Andes of Ecuador and a small village in the Solomon Islands. 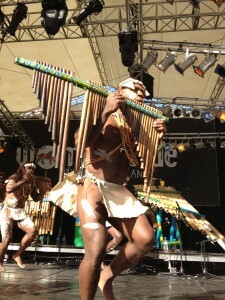 But the WOMADelaide performance from Narasirato really topped it off as they danced their way through a dazzling set of songs, accompanied by a huge array of pan pipes, from small hand-held sopranos to the throbbing bass of the fat bamboo pedestal models, whacked with rubber sandals. Superb. And then there’s the politics. Respect, human rights and social justice are bubbling away through the performances, sometimes overt, sometimes more subtle, but always inspirational. Overt, yet done with great sensitivity, was Blue King Brown’s hosting of the Free West Papua campaign, launched part way through a set of immense power, virtuosity and skill. Singer Natalie Pa’apa’a is clearly committed to human rights causes and makes the very best use of this unique opportunity to reach thousands of potential activists. Is it too greedy to be looking forward to next year’s WOMADelaide already? I don’t think so. 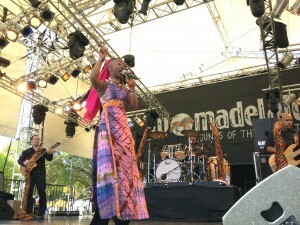 “WOMAD is a snapshot of what the world should be.” – Natalie – Blue King Brown. 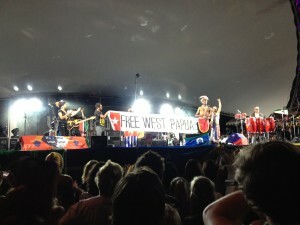 This entry was posted in Activism, Culture, World Music and tagged Blue King Brown, WOMAD, WOMADelaide, world music by Brian Loffler. Bookmark the permalink.